Known for culture and nightlife, this buzzy boho city is a great spot to sample local seafood. After a night on the town, hit the road for unspoiled countryside. 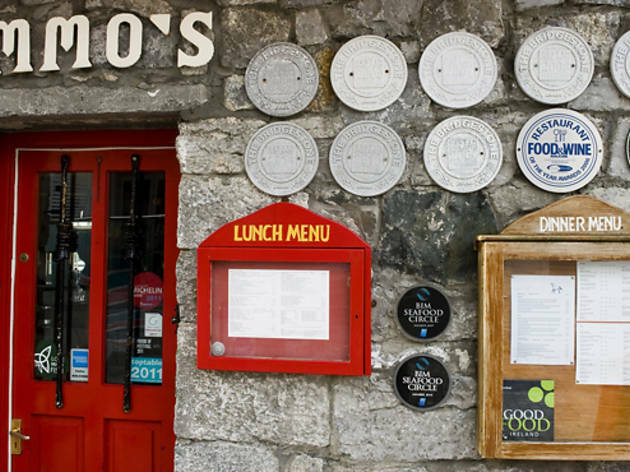 Galway City has always had a bohemian reputation and an artistic and dynamic population, but in recent years it has taken on a more cosmopolitan edge. The presence of two major educational institutions give it a young, upbeat energy. With a great nightlife scene, the city is a vibrant destination for music, art and theater. Highlights of the packed calendar of events include the Galway Arts Festival (galwayartsfestival.com), a huge and internationally renowned extravaganza held over two weeks in July, the Galway Jazz Festival (galwayjazzfest.com) in October and the Tulca Festival of Visual Art (tulca.ie) in November. 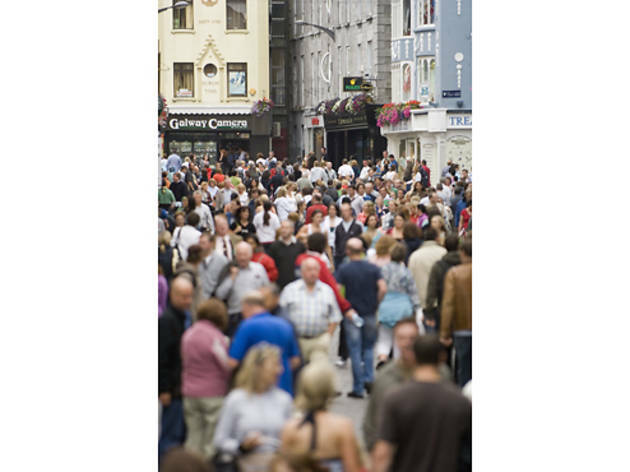 RECOMMENDED: More Ireland tours The old part of the city, known as the Latin Quarter, consists of a maze of winding cobblestone streets and narrow passageways. The remnants of a medieval building, believed to be the Red Earl’s Hall, were discovered during an excavation on Druid Lane, off Quay Street; protected behind glass, they are open to view. Nearby, beside the River Corrib, is the much-photographed Spanish Arch, dating from 1584 and originally an extension of the old city walls (it has nothing to do with Spain). Beyond it is the glass-fronted Galway City Museum (091-532460, galwaycitymuseum.ie. Open summer 10am–5pm Mon–Sat; winter 10am–5pm Tue–Sat; admission free), devoted to the history and heritage of the city. Literary types may want to pay a visit to Nora Barnacle House Museum (091-564743; open end May–mid Sept 10am–1pm; 2–5pm Tue–Sat. Admission €2.50; no credit cards), the childhood home of James Joyce’s wife. Galway’s theaters cater to most tastes. The Town Hall Theatre (091-569777, tht.ie) on Courthouse Square and the associated Black Box on Dyke Road present an eclectic mix of dance, musicals, films, plays and comedy throughout the year. The smaller Druid Lane Theatre is home to the long-running Druid Theater Company (091-568660, druid.ie), which specializes in Irish classics and new writing. 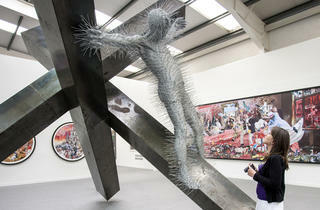 Galway Arts Centre (47 Dominick Street, 091-565886, galwayartscentre.ie)—located across the river in the West End district—presents monthly changing exhibitions of contemporary art. In September, the Galway International Oyster and Seafood Festival (galwayoysterfest.com) showcases locally caught fare prepared by some of the city's best restaurants, plus oyster-eating and -shucking competitions, chefs' demos and food-producer tours, among other events. 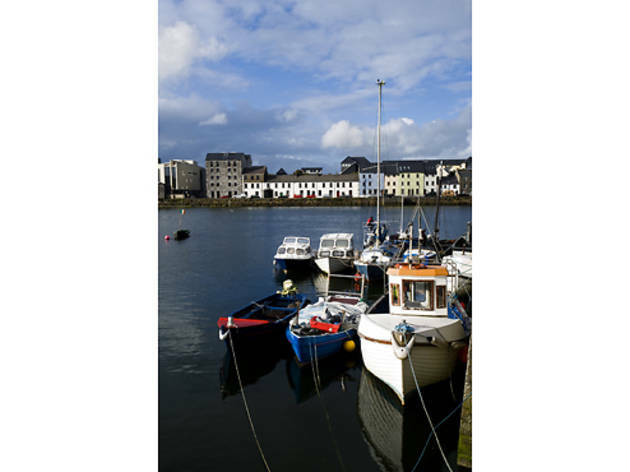 What Galway City may lack in major sights, it makes up for with great restaurants and bars. Most of the best cafés are located in the Latin Quarter. Café by day, restaurant by night, Ard Bia at Nimmo's (Spanish Arch, Long Walk; 091-539897, ardbia.com) has built an excellent reputation in the past few years. The look is eclectic chic—classic wallpaper contrasts with souvenirs from the owners’ trips to Asia—and organic and local produce is used in the hearty, modern Irish dishes. The menu changes seasonally, as does the wine list, which includes organic wines sourced from small vineyards. Nearby, Artisan Restaurant (2 Quay Street; 091-532655; artisangalway.com) is an intimate spot that specializes in imaginative Irish cuisine with a French twist, made from local, seasonal produce. Bars in the Latin Quarter are often traditional and cozy. Tigh Neachtain (17 Cross Street; 091-568820, tighneachtain.com) is one of Galway’s oldest and most celebrated pubs, run by the Neachtain family since 1894. 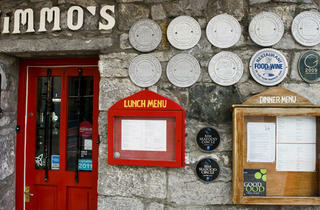 It’s a charming, authentic spot, with friendly service, open turf fires and great live music sessions on Sunday evenings. 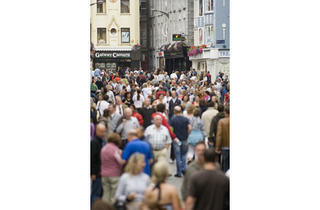 You can’t visit Galway without stopping into McDonagh’s (22 Quay Street, 091-565001, mcdonaghs.net). Established in 1902, it serves the best fish and chips in town. The West End also has some notable restaurants, including Oscars Seafood Bistro (Lower Dominick Street, 091-582180, oscarsbistro.ie, closed Sun), which serves creative takes on the catch of the day, but the area is known mainly for its nightlife. The city’s most renowned music venue, Roísín Dubh (Dominick Street; 091-586540, roisindubh.net) comprises three levels and an extensive, covered, rooftop smoking area. The bar gets packed with students and locals during the week and just about everybody at weekends. Live music—from electro to acoustic to DJs—is played nightly (check the website for lineups), and it’s open until 2am. Monroe’s Tavern (Lower Dominick Street; 091-583397) offers free gigs at 9:30pm most nights and showcases a vast array of sounds, from blues, folk and rock to Irish dancing. Above it is the new Monroe’s Live, where popular Irish bands and DJs attract the crowds after the pubs have closed from Thursday to Sunday (sometimes Wednesday). With its extravagant decor and four bars over two floors, Halo Nightclub (36 Upper Abbeygate Street; 091-565976, halonightclub.com. Open 11pm–2am Fri, Sat; over-23s only) is one of Galway’s best clubs—though the dancefloor is on the small side. 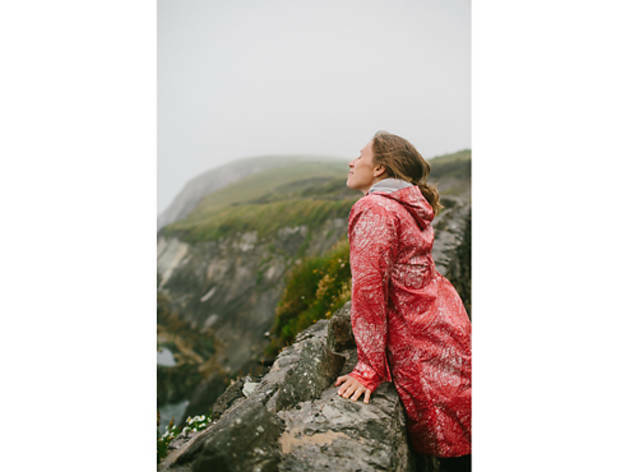 Immerse yourself in Irish culture in Connemara, Ireland’s largest Gaeltacht—or Irish-speaking—region. 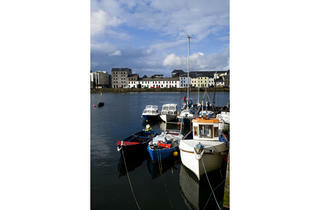 Sitting at the edge of the ocean beneath the Twelve Bens mountain range, Clifden is the area's largest town. 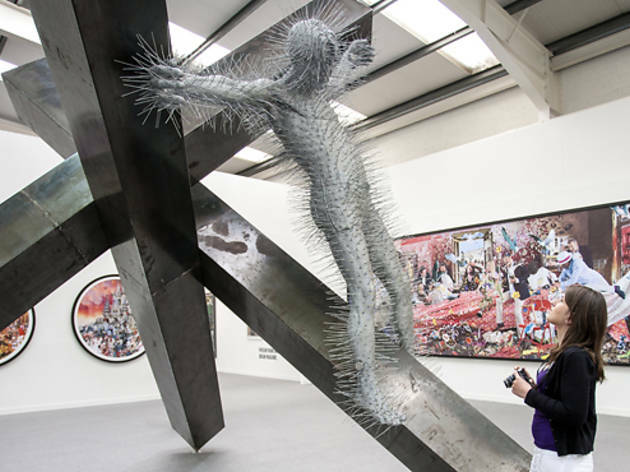 Culture aficionados may want to time their visit with the Clifden Arts Festival (clifdenartsweek.ie), a week-long event in September featuring theater, music and dance. Main Street is crammed with shops, restaurants and cafés. The Whitehorn Gallery (087-2275171, thewhitethorngallery.ie, closed Sun) and the Lavelle Art Gallery (095-21882, connemara.net/lavelleartgallery) both exhibit and sell work by local artists and have some beautiful pieces. Open for more than 20 years, Mitchell’s Restaurant (Market Street, 095-21867) is an informal, convivial spot for sandwiches and chowder at lunchtime and seafood in the evenings. Stretching from Letterfrack to the Twelve Ben mountains, Connemara National Park (095-41006, connemaranationalpark.ie) contains a diverse range of habitats including low-lying blanket bog, heaths covered in purple moor grass, and woodland. There’s a loop of short, well-maintained walking trails; the steep climb up Diamond Hill is rewarded with unforgettable views. Man-made remains include old turf banks, ruined houses, a 19th-century graveyard and, oldest of all, prehistoric court tombs. Look out for the resident herd of Connemara ponies. From Kylemore Abbey, the N59 climbs steeply, eventually opening up to what must be Connemara’s most beautiful view: Killary Harbour, Ireland's only fjord. Here, the sea weaves a narrow route around the sheer seacliffs of Mweelrea, the region’s highest mountains, topping out at more than 2,600 feet. The black water cuts inland for miles, forming a natural divide between Galway and Mayo counties. Killary Adventure Centre (095-43411, killaryadventure.com), located on the top of the hill before the village, organizes activities from kayaking to bungee jumping, and also has decent lodgings.